W.Va. 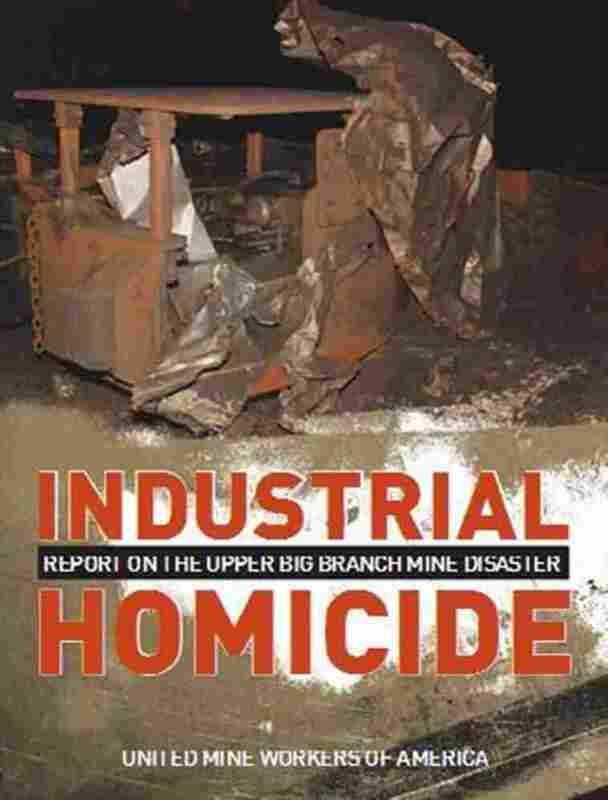 Mine Disaster Called 'Industrial Homicide' : The Two-Way In a scathing report, the United Mine Workers condemns Massey Energy for its actions before the April 2010 explosion that killed 29 men. The United Mine Workers union (UMWA) is out with its own report this morning about last year's Upper Big Branch coal mine disaster in West Virginia in which 29 workers died. Not surprisingly, UMWA blasts non-union Massey Energy, which owned the mine at the time, and was criticized severely in earlier reports from the federal Mine Safety and Health Administration (MSHA) and a team of independent investigators. The resulting explosion on April 5, 2010, "constituted a massive slaughter in the nature of an industrial homicide," the report concludes. UMWA was an official representative of coal miners in the government's disaster investigation even though Upper Big Branch is a non-union mine. The union repeats the same theory for the blast detailed in earlier reports: failure of defective and disabled equipment to temper a small methane ignition, which then erupted into a massive explosion fed by excessive coal dust throughout the mine. The report also criticizes MSHA oversight of the mine, especially in the face of hundreds of citations, violations and fines for dangerous safety practices. "UBB [Upper Big Branch] was a mine crying out for the federal government to step in and shut it down," the report says. "MSHA should have used all the tools at its disposal to do just that until the hazardous conditions were corrected." The United Mine Workers report. The union report targets the district MSHA office for much of its criticism and never once mentions federal mine safety chief Joe Main, a former union official. But the report also contains two new pieces of information that are potentially dramatic. First, the remains of a ventilation curtain next to the longwall mining machine that sparked the explosion indicate the curtain was directing air right on to a critical methane sensor. Directed airflow could have kept the sensor from detecting explosive methane gas, from shutting down the mining machine and from preventing the explosion. This could explain one of the mysteries of the blast. Investigators have wondered why the methane detector near the point of the explosion didn't detect methane and didn't shut down the mining machine as designed. Attorney Mark Moreland is also an official miners' representative in the investigation and was present when the methane sensor was tested at an MSHA lab. "It was working as designed," Moreland says. "I'm unaware of any reason that curtain would be hung there except to direct air to the monitor, which would interfere with its ability to signal a shutdown of the longwall." The mining machine had been shut down much of the day of the explosion due to a maintenance problem. UMWA spokesman Phil Smith says circumvention of a methane detector is "not unknown in gassy mines" where mining machines shut down more often, hurting production. Moreland also recalls something else about the methane sensor that was retrieved from the longwall and tested by MSHA. "The monitor casing was surprisingly clean," he says. That brings up the second major bit of news in the UMWA report. "The investigators found a methane sensor inby the shearer that appeared to be new," the report says. "Despite the explosion, it was not damaged, nor was it covered with any soot or dust." That section of the report is devoted to the four-hour unsupervised excursion underground, immediately after the blast, by former Massey Energy executives Chris Blanchard and Jason Whitehead. "It is unclear how far they traveled in this area," the report says, but the implication is that Blanchard and Whitehead may have somehow planted the fresh sensor because the original was missing or disabled. "It is not clear at this time what actions they may or may not have taken with respect to this methane sensor," Smith says. "Since they have both asserted their Fifth Amendment right against self-incrimination, we may never know." Massey Energy has insisted that Blanchard and Whitehead were searching for missing miners and did not tamper with evidence. Smith confirms that the methane sensor in question is the same one that was mounted by the ventilation curtain described above. NPR has documented an incident involving the deliberate disabling of a methane monitor elsewhere in the mine so that production could continue without interruption. The practice is considered dangerous and possibly illegal. Massey has called the explosion a "natural disaster" caused by a sudden and massive infusion of methane or natural gas from a crack in the mine floor. The company rejects the conclusions of both federal and independent investigators that excessive coal dust fueled the blast. The UMWA report supports the coal dust explanation and includes "flames and forces" maps that trace the multiple paths and directions of the blast, which many experts say fits an explosion fed by coal dust. The explosion was so powerful, the report says, it traveled up a shaft known as "The Glory Hole" into a mine above Upper Big Branch, and scorched the roof there. The union report also is consistent with the MSHA and independent investigative reports, which say the likely source of the explosion was methane leaking from the "gob" or mined out area. All three reports blame poor ventilation, a persistent problem at the mine, for failing to dissipate the gas before it hit sparks generated by the mining machine. Massey Energy was absorbed last year by Alpha Natural Resources in a takeover valued at $7.1 billion. Alpha has promised to provide its own report about the disaster. Alpha Natural Resources spokesman Ted Pile has no comment on the methane sensor issues cited by the report. Pile says the company will review the UMWA report, as well as the others that have been released so far. As for Alpha's own report on the disaster, "this is not a process we want to go through hastily," Pile says. "We'll reach our own conclusions about what happened at Massey's UBB mine in due time." MSHA has also now weighed in. Mine Safety chief Joe Main says MSHA "is in agreement with the majority of the findings in the UMWA report" but doesn't say which ones the agency disputes. Main does not directly address criticism of his agency but says, "MSHA has already begun to make a number of administrative, regulatory, and policy changes as a result of the lessons learned from UBB, and we are aggressively moving forward with those changes to improve the safety and health of our nation's miners."